Miami Dade College opened its doors in 1960 amid the transition of desegregation and the influx of thousands of Cuban refugees. Initially, 1,428 students entered "Chicken Coop College," nicknamed for the original buildings that were transformed into classrooms. Dade County Junior College, as it was then known, was open to any county resident who had graduated from high school. The student body included the seven black students who made Dade County Junior the first integrated junior college in Florida. These students, along with the many Cuban refugees seeking to better their lives, paid a five dollar application fee, but tuition was free to all county residents. By the mid-60s, the College was already thinking long range. With nearly 15,000 students attending, the original North Campus buildings were bursting at the seams. New construction was under way, with an eye toward not only a second campus in Kendall, but a third in downtown Miami. 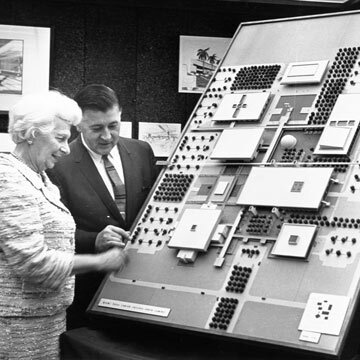 By 1967, the College was the largest institution of higher education in the state of Florida, enrolling 23,341 students. Dade Junior had become the fastest-growing junior college in the nation. It enrolled more freshmen than the University of Florida, Florida State University and the University of South Florida combined. In the mid-70s, Miami Dade's guiding philosophy of "access with excellence" was clearly defined. A bold educational review reaffirmed the College's open-door policy and toughened academic standards. The project and its goals became the standard for community colleges across the country. K. Patricia Cross, visiting professor at Harvard's Graduate School of Education, called Miami Dade "the most exciting institution of higher education in the country." The excitement spread to every corner of this changing community. The downtown campus, later to be re-named for one of the College's founders, Mitchell Wolfson, was born in 1970.The Medical Center Campus came into being in 1977, and bilingual studies became a full-fledged division in 1979, with more than 2,000 students enrolled in outreach centers in the Little Havana area. These centers would soon become the InterAmerican Center, the largest bilingual facility in all of higher education. By the 1983-84 academic year, the effects of a changing community were reflected at the College. Thirty percent – nearly 18,000 students – were immigrants or refugees, and 46 percent reported that English was not their native language. Almost two-thirds of Miami Dade students were minorities and 56 percent were women. Part-time students were common. 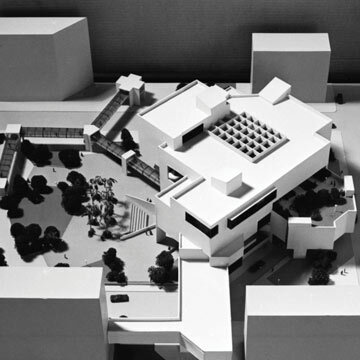 In 1984, the New World School of the Arts was conceived, designed to train future performing and visual artists from high school through the Baccalaureate. The school became an educational partnership of Miami Dade College, Miami-Dade County Public Schools and Florida International University, with FIU handing the baton to the University of Florida in 1997. Today, New World is recognized as one of the premier arts high school/college programs in the country, with the work of its graduates gracing venues from New York to Los Angeles. The year 1984 also was witness to a modest College-sponsored bookfest on Kyriakides Plaza at the Wolfson Campus. "Books by the Bay" drew a surprising crowd of 25,000 people over two days. Today, Miami Book Fair International is not only South Florida's premier cultural happening, it is the most respected literary event in the country, drawing 250 premier authors, 300 of the world's renowned publishing houses and booksellers, and half a million fairgoers. 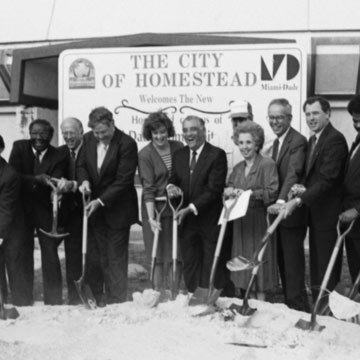 In 1985, the College's fifth campus, Homestead, opened in the First Baptist Church with 350 students. By 1991, a modern campus facility had been built for South Dade's ever-growing student population. With the closing of the decade, the College's place in education was nationally recognized: the prestigious University of Texas Community College Leadership Program identified Miami Dade as the number one community college in America. College personnel challenged the mindset of the past by initiating comprehensive reforms in academic programs and administrative operations. A thorough Education Review revamped the academic core and electives, modernizing the curriculum to meet the needs of a changing society. Progressiveness was not limited to education, as the re-engineering process also brought improved strategies to human resources, maintenance operations and budget formulation. The College's effort to streamline its bureaucracy and contain costs brought a new financial stability, freeing resources for new staff and program development. 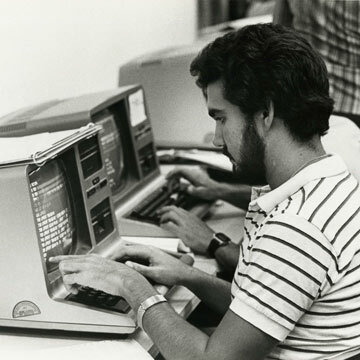 The College's Technology Master Plan put Miami Dade on the fast-track in academic and administrative computing throughout the 1990s. Miami Dade sought to keep pace with the changing economy and workforce, developing strong partnerships throughout business and industry. More than 50 new degree and short-term certificate training programs were developed, all aimed at emerging industries and South Florida's job market. The College developed multimedia classrooms and the Virtual College placed Miami Dade on the Internet map, allowing students to "attend" classes via the World Wide Web. Recognition soon followed: Yahoo's Internet Life proclaimed MDC "WIRED," and voted the College "second best of all colleges and universities." The College's information technology efforts also gained residence in the Smithsonian's permanent collection with a nomination for the Smithsonian Innovation Award. The College's sixth campus became a reality in the mid-90s when the already matured InterAmerican Center was granted campus status by the District Board of Trustees. It was subsequently accredited by the Commission on Colleges of the Southern Association of Colleges and Schools. The new millennium dawned and Miami Dade breezed through the Y2K jitters safe and sound in its mission to serve students. The College's new Learning Agenda laid out the next phase of growth, exploring new learning models and student support programs, as well as campus, faculty and leadership development efforts. As always, students stand at the center of this vision: their success is the ongoing, number one priority of Miami Dade College. The Honors College offers a scholarly environment that challenges academically gifted and intellectually curious students. In addition to expert teachers and a rich comprehensive curriculum, The Honors College offers students a generous scholarship award, college wide support services and enrichment opportunities that include attendance and participation at national and regional conferences, internships, corporate coaches, travel study tours, university transfer counseling and an individual educational plan. The successful Honors College graduate will be prepared to transfer to many of the most prestigious colleges and universities in the nation. The Emerging Technologies Center of the Americas (ETCOTA) is Miami Dade College's response to the need for a qualified workforce to fill the thousands of new jobs in Information Technology and Telecommunications. ETCOTA is a dynamic, state-of-the-art 40,000 square-foot facility housing 19 multimedia classrooms and labs equipped with high-end computers, specialized instrumentation equipment and simulation work-stations. The Center, located at the Wolfson Campus, also has a 120-seat auditorium and offices for faculty and staff. The College continues to contribute to the region's cultural landscape via the nationally acclaimed Cultura del Lobo Performance Series and the reinvigorated Miami International Film Festival. MDC's management of these projects opens the door for student artists by allowing them to take advantage of unique learning opportunities. The New York Times named MDC's cultural programming among the best in academia. The College recently welcomed its inaugural baccalaureate class in teacher education, responding to a community and statewide need for teachers in the K-12 system. Baccalaureate degrees are offered in secondary math and science as well as exceptional student education. With the addition of four-year degrees in 2003, the institution changed its name to Miami Dade College. While the word "community" is no longer in the title, the College remains committed to the educational needs of individuals and industries throughout South Florida. In 2005, MDC received official re-accreditation from the Southern Association of Colleges and Schools (SACS), the regional accreditation body. At ten-year intervals, SACS places higher education institutions under the microscope, and MDC passed the review with flying colors. During the review, MDC introduced a special effort to address mathematics learning via "The Math Connection," a five-year program of continuous improvement for math students. The year 2005 also saw the beginnings of Learning Agenda II, a reform effort with special emphasis on learning outcomes, assessment and competencies. 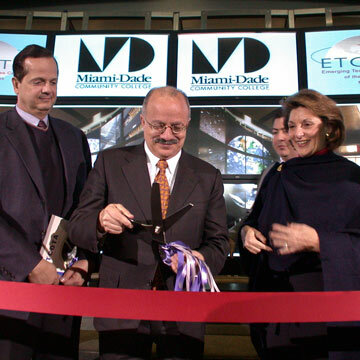 Then MDC became the proud steward of Miami's signature building. The historic Freedom Tower, the Ellis Island of the South, received the many immigrants who flocked to South Florida in the 1960s and 1970s and also housed the Miami Daily News and Metropolis newspapers. In 2006, MDC reached an astonishing milestone: welcoming its 1.5 millionth student. In a community of 2.3 million, MDC's role remains central to educational, social, cultural and economic growth.